The British struggled to produce decent tanks in WW2, coughing up a string of poor designs. The result was that the Army lost confidence in British tank design and switched to using American tanks like the Sherman and Stuart, which were better and available in large enough numbers. When 8th Army moved from North Africa into Italy they left all their British tanks behind. 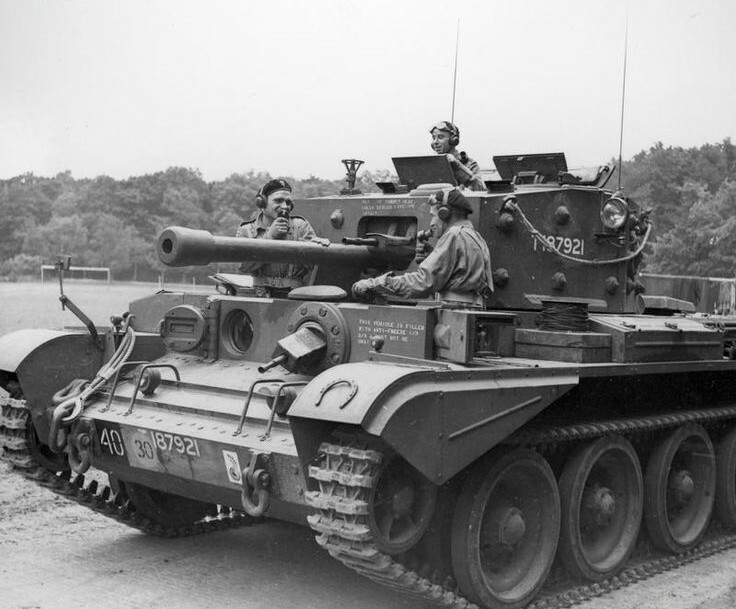 It wasn’t until very late in the war that decent tanks started rolling out of British factories, culminating in the excellent Centurion which soldiered on for decades after. The Cromwell tank used by General Maczek when he led 1st Polish Armoured Division through France and the Low Countries. This is actually the command version of the tank with extra radios and a wooden dummy gun. By 1944 the British tank industry had pulled its socks up enough to produce the Cromwell. The design had a few problems (such as bad emergency egress) but wasn’t actually terrible. In terms of armour and firepower it was very similar to the Sherman tanks already equipping the armoured divisions, but it was faster. So it was decided that the Cromwell would equip the armoured reconnaissance battalion each armoured division. In this role, the Cromwells would often be the vanguard of the division and saw lots of action, performing well. I didn’t build this model, it was built and painted when I got it, so I can’t really comment on construction, but the instructions look pretty straight forward. The markings on it when I got it were for a British armoured division, so I changed them for those of 10PSK (10 pułk strzelców konnych or 10th Mounted Rifle Regiment), the armoured recce element of the Polish 1st Armoured Division. The tank was missing the commander’s hatch, so I made one out of a couple of bits of plasticard, and I added one of the nice Perry tank crew. No tank is complete without some extra stowage, I went for jerry cans, tracks and bits of personal kit, and I added a scoped No.4 on the roof of the turret. There’s no historical basis to that, I just felt like the tank commander might like a sniper rifle to take a crack at anything that was bothering him (or looked edible). Apart from that I’ve not done much to it. I left the base colour and simply applied some effects over the top. The kit has tons of surface detail on it, even on the underneath. The whole vehicle is covered with rivets, bolts, hatches and panels. This gives it lots of visual appeal, but was a bit of a mare to pin wash. The tracks are two piece jobs, separate to the road wheels like the Italeri/Warlord Sherman kit. There’s some good non-moulded detail in the kit, too with periscopes, lights, and tow hooks. It comes with two chunky plastic antennas, but those are just a liability IMO. After changing the decals I gave the paint job a bit of a spruce up. It had already been basecoated and heavily drybrushed, so I gave it a wash of the nice Army Painter strong tone ink and a bit of Liquitex Burnt Sienna ink on the lower half, then pin washed all the detail, drybrushed in AP Goblin Green and weathered it with some Tamiya weathering powders. Ready for the table I reckon. From what I’ve read 1st Armoured Div’s Cromwells always went into action first (supported by M10s and infantry in M5 half tracks), with the Shermans coming up later after 10PSK had fixed the enemy’s position. I’ve got an idea for a Chain of Command campaign involving the Poles dashing as fast as they can to grab bridges as they pursue the Germans through the Low Countries and the speedy Cromwell should be their go-to tank in those running battles. Good work on that Cromwell! The subtle but effective weathering is very good. Can I ask … what is pin washing? Thanks. Matt. Cheers Matt! Pin wash aka black lining. Basically painting black ink with a fine brush into all the panel lines and things like rivet heads. Thanks Andy. Crumbs, that sounds like a lot of work but I think I might give it go when I get around to my ‘proper’ tanks :o) Got a Sherman, Cromwell and a Tiger (!?) saved for a rainy day. Certainly very effective. Nice job Andy, on spoorsing up the Cromwell, with the commander and the weathering.